Welcome to the lake! We just built this custom cedar vacation home last year and designed it for quiet vacations away from it all. The home is isolated, with no neighbors in sight and hidden at the end of a long driveway, not visible from the road. On the lakeside of the house is an over-sized great room with cathedral ceilings, a large stone wood-burning fireplace, a dining room with space for up to 14 adults, an island kitchen with professional stainless appliances, including 3 ovens and triple sliding glass doors leading out to a massive wrap-around deck overlooking the private lake and private dock which comes with boats ready to enjoy. 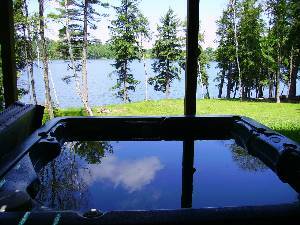 There is also an outdoor 6 person Hot Tub to relax after a long day! We provide satellite TV with all of the premium movie channels included. The home has 4 queen beds and 8 twin beds and sleeps up to sixteen. It has five bedrooms (including three master bedrooms with attached full baths), and five full bathrooms overall. 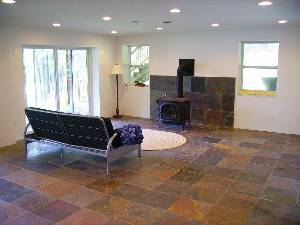 The main floor is finished in oak hardwood and the walk-out basement is finished in oversized slate. Our lakefront home has central heat and air conditioning and is completely furnished and fully equipped to comfortably accommodate small gatherings to large groups with enough plates, glasses, silverware, linens, towels, and everything you'll need for a truly enjoyable stay. We include a row boat, and two peddle boats which are essential to truly enjoy the spring-fed glacial lake. Fishing is permitted and because the lake is so rarely fished, the fish often bite a bare hook! We have a floating dock for swimming and enjoying the sunsets. In the winter, there is ice fishing. If the weather doesn't cooperate, we also have a pool table, foosball table and air hockey in the basement den to enjoy. Feel free to sleep in, cook your own farm-fresh breakfast, plan a gourmet dinner and enjoy the fresh air and the sounds of the birds flying over the lake. From Memorial Day to Labor Day we only rent by the week, at all other times, we are flexible to meet your needs. Soccer Hall of Fame, 30 minutes; Baseball hall of Fame, 45 minutes. Several museums and trails in the area. This was the second straight year that eight of us have met here for the weekend and this is the pefect place on all accounts. The house is great and would easily accomodate even bigger groups. 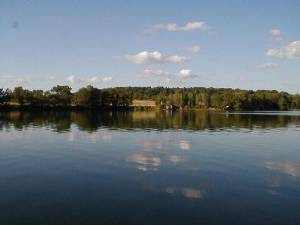 The location and lake are very nice, and it is not all that far to stores, restaurants, Oneonta or even a trip to Cooperstown. To top it off, the owner is very friendly and easy to work with. We are already making plans for a 2008 (and beyond) return. counter space which will make any caterer happy. evenings with great dinners and a roaring fire!! house so much that no one wanted to leave!!! definitely be back again in the future!!! First family vacation with my grown children and grandchildren.Spectacular home with every possible amenity.Canoeing on a beatifull lake, fishing,and ending the day relaxing in the hot tub.The property is half an hour from the Baseball Hall of Fame, Howe Caverns and Catskill Game Farm.We would do it again in a second. A truly fabulous place for a quiet, peaceful vacation. 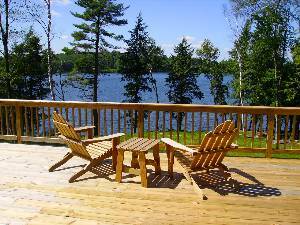 Lots of space, a well-equipped kitchen, spectacular lake view, large deck with plenty of chairs (and a grill to boot), gorgeous trees, hot tub...everything you could want. And a gracious owner that attends to every detail to make your stay enjoyable. Planning on going back again soon. A group of five of us used the house during March and even with snow on the ground there was plenty to do. We were able to go skiing and then come home to the hot tub! The house was even more spectacular than the pictures let on. My friends were left wanting to know when we were coming back! The rentor is thoroughly professional and a very gracious host, between all of the firewood, the games to play and the abundance of TV stations, we didn't need anything. 7 of my girlfriends and I stayed at the house for a weekend in October. The foliage was beautiful, and the house was amazing. Every detail was considered and taken care of. I also really enjoyed working with the landlord because of his professional, responsible, and cordial business practices. I would absolutely recommend this property. Our family had the wonderful experience of staying in this "House At the Lake" last week, 8/6-8/13/05. We had 7 adults and 4 kids...and of course, our dogs. Each one of us had such a peaceful, relaxing time together. My husband and brother are fisherman and my husband actually made the statement that Lake Titus provided the BEST freshwater fishing he has ever done! WOW now that is a statement! The house was clean and beautiful and provided just about everything we could have possibly needed! THANKS! My family and I stay somewhere different every year and we are thinking seriously of returning to this property. The house is amazing! The fishing was great - my five year old enjoyed it as much as the swimming. The large dining room table made it possible for us to all sit together for meals and play games late into the night. The deck is huge and it seemed like there was always a light breeze blowing. 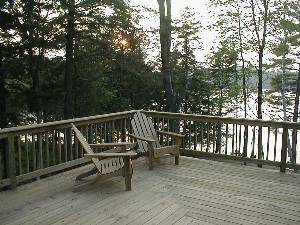 The rocking chairs on the deck were a perfect addition. The kitchen had everything we needed and I'm so glad the grill is charcoal and not gas. The location is very private and quiet. It was beautiful - we didn't want to leave. The House At The Lake was all that was advertised and much more. Being one of the first groups to occupy this brand new house, we really had no idea of what to expect. Our family, consisting of 6 adults and 4 children, found the house and the location to be ideal. 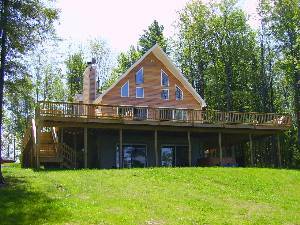 The house contains every convenience that you might require and the location on Titus Lake is both scenic and serene. We use this week every year as a means to relax and catch up on the happenings of our busy children and grandchildren. The house at the lake served this purpose perfectly. The grandchildren even caught some fish. The general consensus of the family was that this choice was the best we've made to date. As a matter of fact everyone was so impressed that we have already expressed our desire to return next year. Home is rented year-round. Weekly in the summer and weekends the rest of the year. 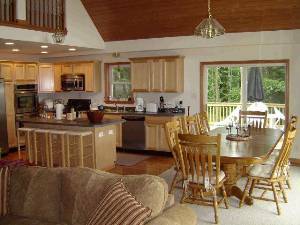 Summer weekly rentals (Memorial Day to Labor Day) are from $2650/wk Saturday to Saturday. 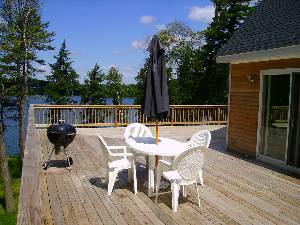 Non-summer year-round weekends are $1050 for 2 nights and $1250 for three night weekends. For Holidays, please inquire on pricing. Midweek rentals are discounted. Cancellations and Refunds: Full refund if cancelled more than 30 days before rental begins.